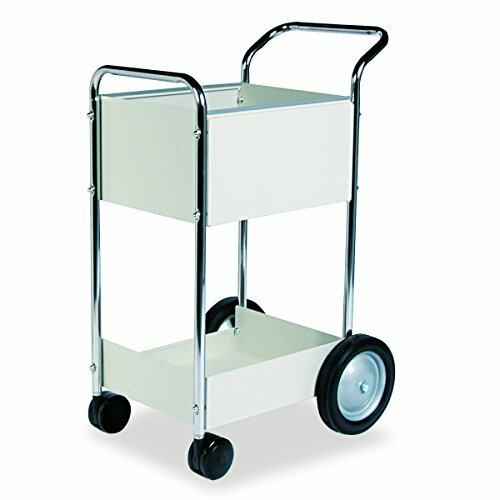 Ideal for delivery needs in smaller spaces. Top basket holds up to 75 legal size folders while the bottom shelf holds bulk mail or packages. Includes twin wheel front casters and large rear wheels. Rugged steel construction ensures durability. 200 lb. total cart weight capacity. Top Basket Dimensions: 10"H x 16”W x 18”D, Bottom Shelf Dimensions: 5"H x 16”W x 18”D and Total Dimensions: 39-1/4”H x 20-1/2”W x 26”D. View More In Mail Carts. If you have any questions about this product by Fellowes, contact us by completing and submitting the form below. If you are looking for a specif part number, please include it with your message.